basket ball is a very popular game in the word. Now lets we try to know something and try to learn rules and regulations of basketball. Now read attentively - About basketball. America. But the competitive game was started since 1992. Dr. James Neismith was the father of this game. He was the director of physical education in Y.M.C.A. College, Springfield U.S.A. International Basketball federation was formed in Germany in 1932. Basketball was included first as a completive game in Berlin Olympics in 1936. It is a national game of America. 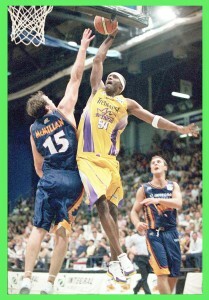 Now a days, basketball has become popular in many countries in the world. Dr. John Henry of Y.M.C.A college at Kolkata comes forward to start the basketball game is played in this subcontinent. 1. Court: The dimension of basketball court is 28.65 meter or 94 feet in length and 15.24 meter or 50 feet in breadth. For School and college student their court is 25.62 meter or 84 feet in length. The height of the roof from the court without obstruction at least 7 meters. All lines are of the same color. If the board is crystalline glass so marking will be white, on the other hand, will be black. The line will 5 cm. in width. 2. Centre circle: The measurement of the center circle and restricted area circle is the same. The radius of the circle will 1.83 meter or 6 feet. At the time of starting two players of two teams will stand in the middle of the circle and other players will stand out of the circle. The game is started by jump ball from the circle. 3. Ring: The thickness of the basketball ring is 0.017 meter to 0.020 meters. The height of the ring from the court is 3.05 meter. Drawing an arc of 6.25 meter radius from the central point of the ring three points line is drawn. 4. Ball: The size of the ball is round shapes, the weight of the ball is 567 to 650 gram. The circumference of the ball is 74.9 to 78 centimeter. It will be made by leather like bladder of rubber. The colour of the ball is orange. 5. Foul and violation: If a player intentionally comes in physical contact with opponent player is called foul. When a player dishonors the law or break the rules of the game that is called violation. a. Holding the opponent, pushing, resisting the advance of the opponent team with two hands and striking the opponent. b. If someone displaces the opponent forcibly while taking the ball with drops. c. Touching willingly an opponent who is not holding the ball. d. Misbehave with the opponent or the umpire. a. Walking or running two steps with the ball without a drop. b. To move two steps here and there with the ball in hands. c. Dribbling the ball with two hands. d. Staying more than 3 seconds in the opponent court while the ball is in the grip of one's team. e. Holding the ball for more than 5 seconds. f. Holding the ball for more than 8 seconds in own half not to go opponent court. g. The team holding the ball does not try to the ball basket within 20 seconds. 6. Officials: For conducting the game the officials are referee one, umpire one, scorer one, Assistant scorer one, Timekeeper one, 24 seconds operator one. 7. Duration: The game will be four quarters, each quarter will ten minutes. The rest will be ten minutes, end of the second quarter and before starting in the third quarter. Between others quarters rest will two minutes only. 8. Scoring of the point: During the game, a player scored from outside the 6.25-meter arc will get 3 points, within 6.25-meter area will get 2 points and scored from free throw will get one point. 9. Players: The game of basketball is played two teams Each team will consist of 12 players. But only 5 players from each team togetherly to participate in the game. 10. Time out: First and second quarter each team will have one time out third and fourth quarter each team will be taken 3 time out, extra period each team can be taken one time out. Duration of time out is one minute. time for 5 minutes will go on continuing until it is settled. Playing basketball needs the ability of breathing, power of running, jumping and with the agility of a body. The main tactics of playing basketball are stance, gripping the ball, the right passes and dribbling the ball, shooting and basketing the ball, guarding the opponent etc. 1. Stance: Stance bears a special significance during the play. Many a time, one has to take a stance for a moment, for planning successful attack and defense. For taking the correct stance one has to stand always extending the legs or spreading out the legs and bending the knee. All kinds of passes learn is essential. But chest pass is most important. 4. Dribbling: During dribbling, the ball is pushed with fingers and the fingers are spread out over the ball to a great extent. This technique helps to take control of the major part of the ball. Use of the wrist and finger infallibly makes possible pushing the ball beautifully so that it jumps upward and then catching the ball and keeping it under control becomes easier. st, be kept high and straight. Never keep your eye on the ball rather keep it always in front, so that the players of your own team and opponent team can be clearly observed. (a) Set shot: When shot is taken by standing on the spot is called set shot. This is to be done by one or both hands. The shooting hand will be from behind and the other hand will be at the side of the ball during a set shot with one hand. The ball is to be pushed by the shooting hand and if that time, the other hand will be off from the ball. (b) Lay up shot: Normally a lay up shot is taken to score from a short distance. A player moves forward with a fast dribbling and he jumps up on his fast from the ground and tries to take a lay up shot direct to the basket or with the help of back board. At this time, the shooting hand will be straightway upward. I hope you have got a small idea on Basketball. To learn more read more details article from various kinds of source. Oh yes, don't forget to share this article to your friends on facebook.